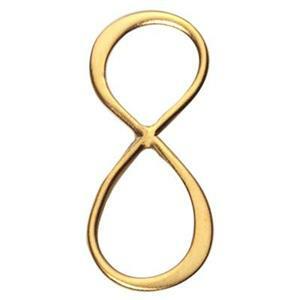 Gold plated sterling silver infinity link to signify eternal love. A dainty design with smooth curves and subtly wider flat sections on opposite sides. This piece is an exceptionally jewelry finding that can be a focal piece or an anassuming design element depending on the scale and concept of your complete piece. Notes: Matte finish, 2-sided, .9mm approximate thickness. Gold plating is 1 micron thick over a thin nickel barrier to prevent migration of the sterling silver through the gold layer. The nickel barrier improves the durability of the finish. International customers, please note that some countries do not allow nickel barrier products. It is your responsibility to know customs requirements in your home country.